Daily protection- Improve muscular endurance, protect the knees and offer pain relief and moderate support. Perfect match- Easy on, Easy off. Breathable. Non-slip, keeps knee stable. Not bulky, fits perfect under jeans. Sport fit- Basketball, volleyball, tennis, golf, cycling, baseball, MMA, soccer, football, hiking, skiing. Warranty- Datechip provides our customers of Knee support sleeve with warranty as non-artificial damages, 1-month replacement, 3-month warranty. 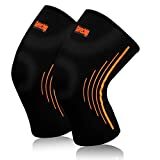 •Wear as a base layer for added comfort as knee warmers. And if you buy a wrong size, we will also be willing to replace you with a right one.